Nothing like a good project to create an opportunity for excellent father and son time. While building and creating something alone has its time and place there is something special about building with someone else. It is even better when it is doing something that has been a part of your relationship forever. Today I had a wonderful opportunity to work with my dad as we build and then tiled our bathroom floor. Having my dad here to help was a godsend. 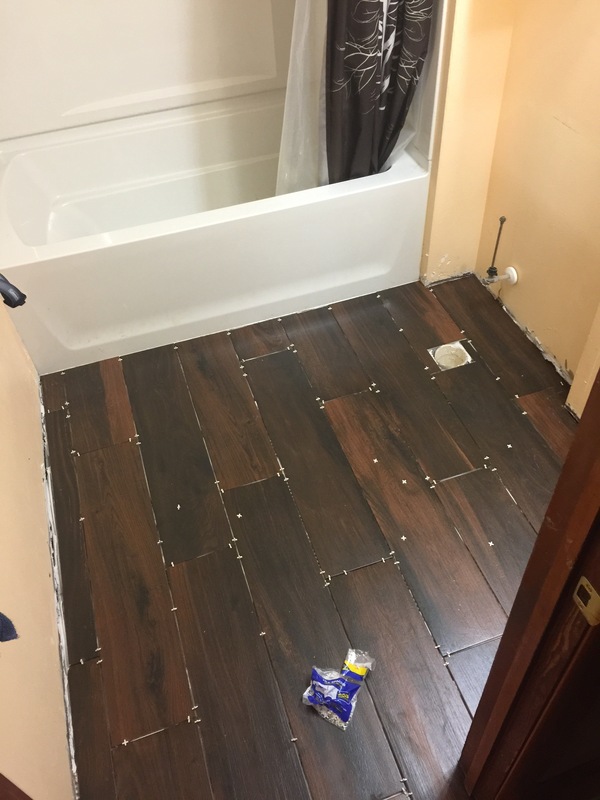 In addition to bringing the tile saw he brought years of knowledge and experience that saved me from many a mistake… kind of like the ones I made on my own that led to having to replace the tile in the first place. An extra set of hands always helps a ton and we saved a lot of time by having him cut tile and I set it. That in of itself would be worthy of being my blog topic today, but that’s not what I’m most thankful for today. Working with him and spending time with him is why I’m thankful for projects like this. In all honesty I could’ve struggled through it on my own and thought about going that route, but then I realized what an opportunity this was for the two of us to share time together. It is also fitting because some of my favorite times with him involve building something, working on something, or cutting brush and trees in the woods. Having those times together allow us the chance to both have quiet, to create something that would not have been there had we not willed it into being, and all the while have conversation. The conversation has ranged from deep, complex, and spiritual to instructive and teaching to grade school humor. In that balance we are able to communicate, be ourselves, and remember to not take ourselves too seriously. It’s great! It also reminds me to continue to find ways to bond with my boys. Time with my dad is also time for me to “sharpen the saw” and learn to be a better dad. It reminds me of how much I appreciate the time with him and helps remind me that my boys appreciate time with me, even if it isn’t always clearly visible. I need to remember to keep finding way to connect with my boys so that when they or I need some father son time we have already build bonds and have ways of connecting. Maybe it’s projects, maybe it’s Scouts, maybe it’s running, or maybe it’s something completely different. Who knows? What I do know is that it’s up to me to keep an eye open for it. The biggest success is something that you won’t see in the picture. It was the smiles we both had on our faces as we worked together. I’m very thankful for this project that I worked on with the Old Man.